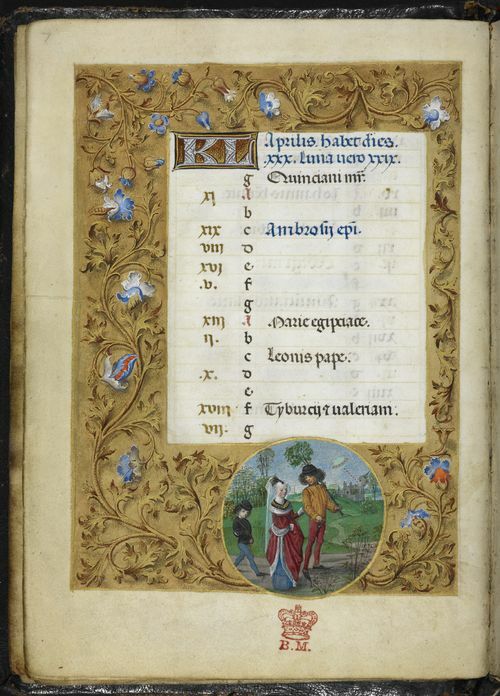 The month of April, like that of March, was a difficult one for a Medieval artist to represent. 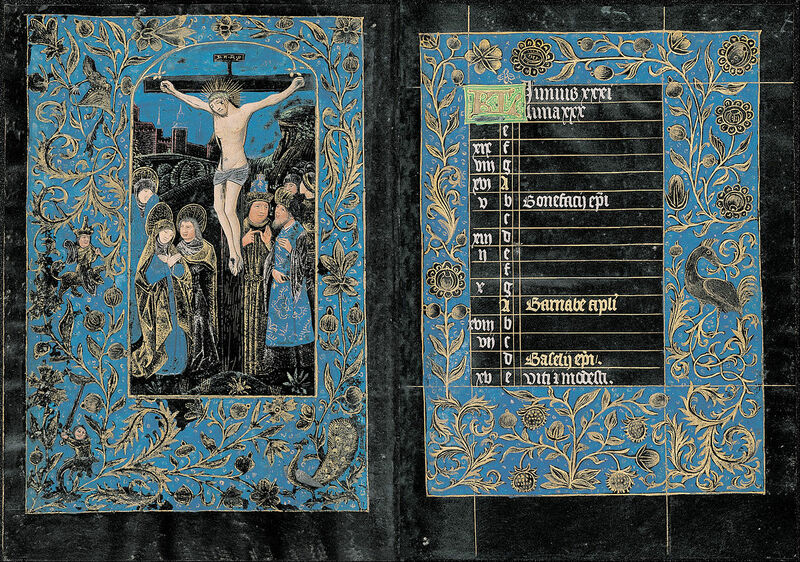 An illuminated manuscript, such as a book of hours, was an expensive gift, intended not only to last a lifetime, but in due course to become an heirloom. 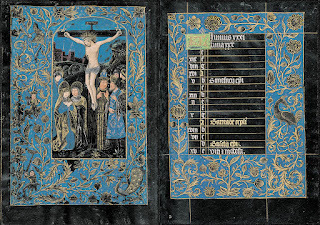 In some years, however, the Christian solemnities of Easter fell in March, allowing April to be devoted to secular pleasures, including courtship (the priorities of young men and women reflecting those of the wild birds and animals around them); whilst in other years (like this one), these solemnities fell in April, in which case people were expected to remain focused on devotional themes. With lambing completed, and flocks released into the meadows once again, pastoral scenes might be thought of as appropriate in either case: since they could be seen either as straightforward representations of a stage in the agricultural year; or, metaphorically, as symbolic of "the lamb of God." 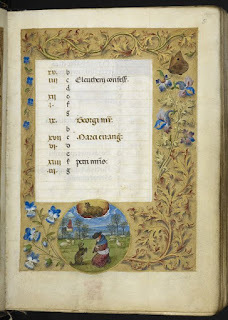 Calendar page for April, from the Huth Hours: a sheepdog dances to a tune played by the shepherd. British Library, Add. 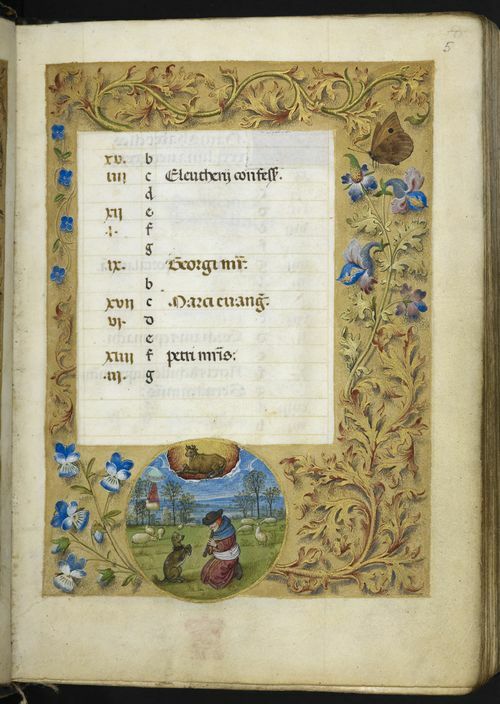 Ms. 38126f4v (image is in the Public Domain). 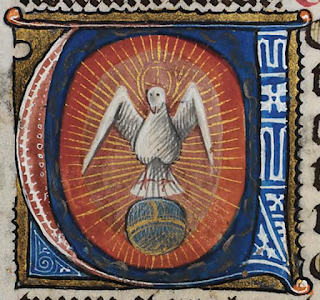 In those years in which Easter fell in March, the month of April was dedicated to the Holy Spirit, reflecting the ethos of Pentecost, and the acts of the apostles, inspired by the spirit. 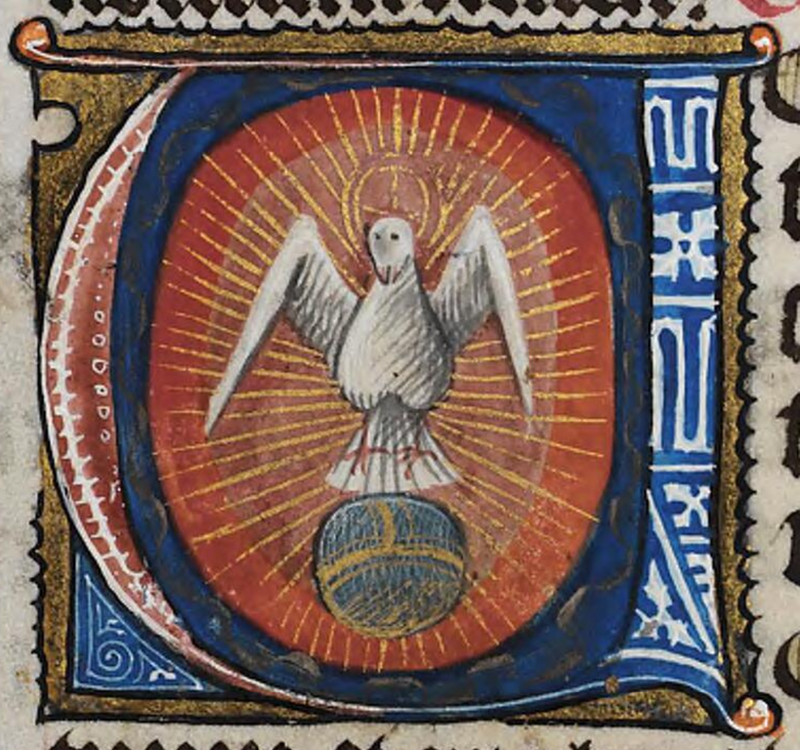 The Holy Spirit, from the De Grey Hours, c 1390, National Library of Wales MS 15537c (licensed under CCA). 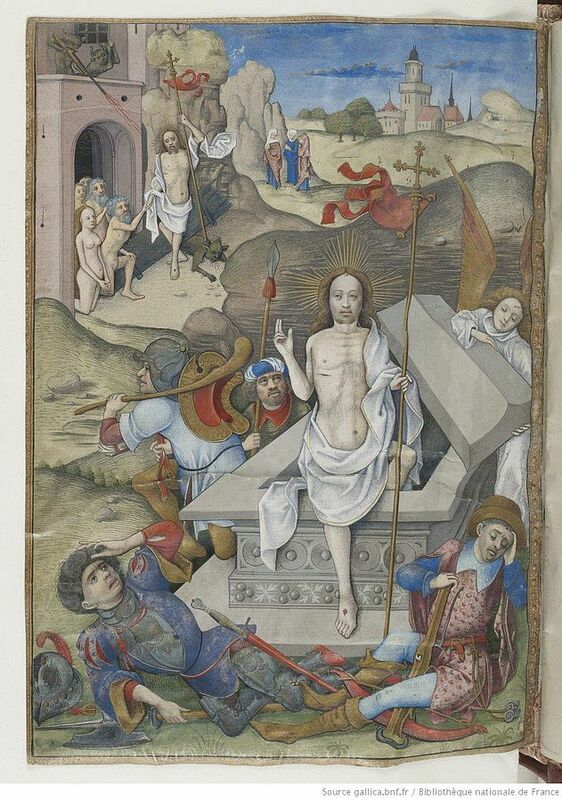 Easter itself, however, was always marked by a commemoration of the passion, death, and resurrection of Christ. The Franciscan orders had introduced the "Stations of the Cross," as a physical re-enactment of these events, first of all in the holy places of Jerusalem itself (which were in the care of the Franciscans), but subsequently in Franciscan priories across Europe, and even in parish churches, with priests or friars leading the faithful from one "station" to another, each representing a particular stage in Christ's journey to the cross. 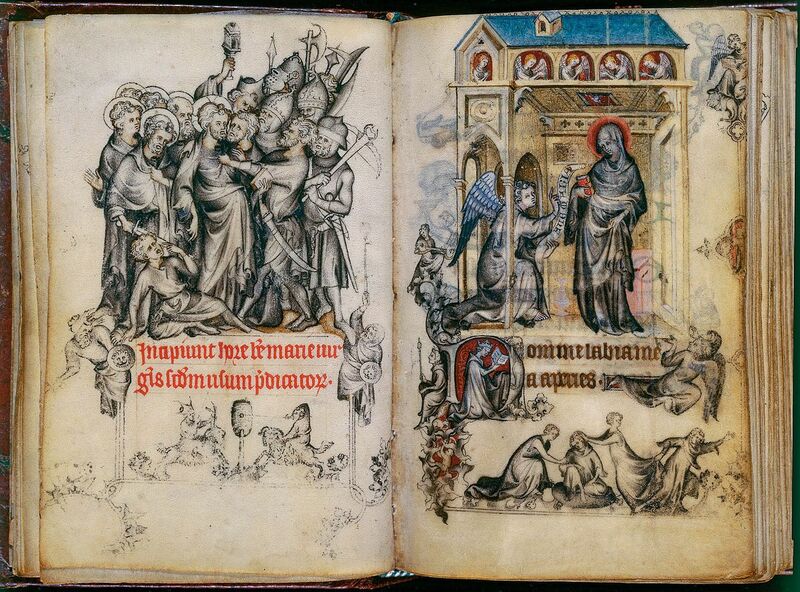 These stages were similarly depicted in the books of hours that the wealthy used as an aid to their private devotions. 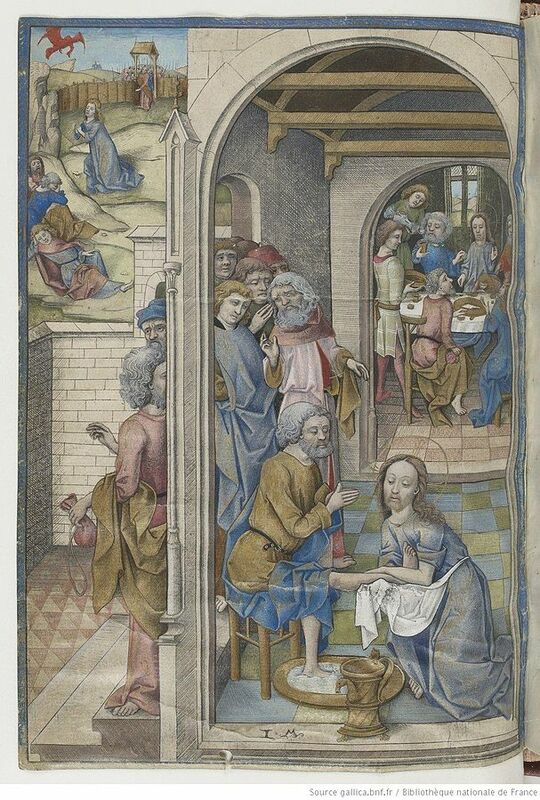 The Last Supper, from the Hours of Charles d'Angouleme, late 15th Century. The artist, Robinet Testard, has, in effect, plagiarised the composition of the engraver, Israhel Van Meckenham, pasting it onto the vellum and adding colour. 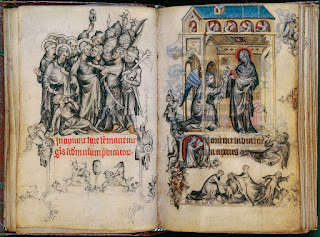 National Library of France, Latin MS. 1173. Image: Cardena2 (licensed under CCA). 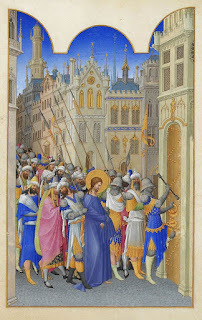 The Arrest of Jesus (left) and the Annunciation (right), from the Hours of Jeanne d'Evreux, 1325-1328. The artist is Jean Pucelle. Metropolitan Museum of Art, New York (image is in the Public Domain). 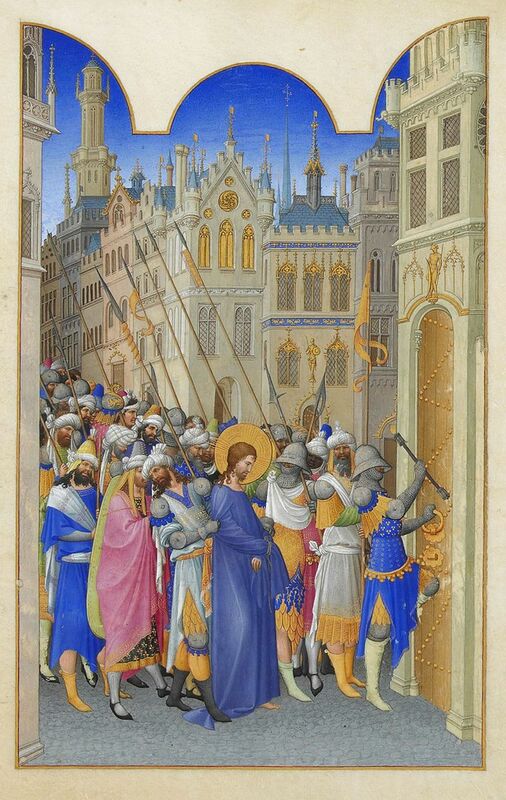 Christ led to judgement, from Le Tres Riches Heures du Duc de Berry, Musee Conde, Chantilly (image is in the Public Domain). Christ is assisted by Simon of Cyrene, from the Hours of Charles d'Angouleme. Image: Cardena2 (licensed under CCA). 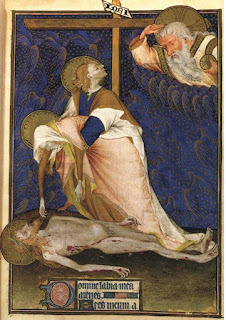 The Crucifixion, from the Black Hours, c 1480, Pierpoint Morgan Library MS. 493 14v/15r (image is in the Public Domain). The Lamentation of the Virgin, from the Rohan Hours, c 1435. 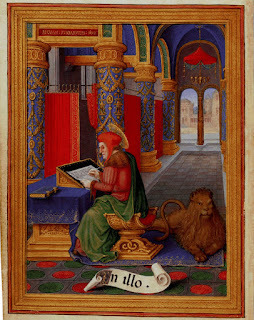 National Library of France Latin MS 9471 (image is in the Public Domain). 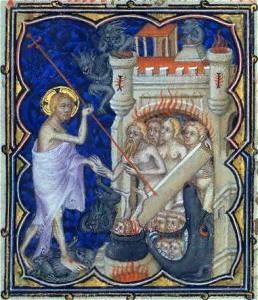 The Harrowing of Hell, from Les Petites Heures du Duc de Berry (image is in the Public Domain). 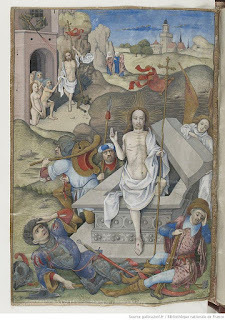 The Resurrection of Christ, from the Hours of Charles d'Angouleme. Image: Cardena2 (licensed under CCA). The Feast of Saint Mark falls on the 25th April, by which time the solemnities of Easter would, in almost all cases, have been completed, allowing secular concerns to come once more to the forefront of people's minds. Saint Mark, from the Sforza Hours, c 1519. The artist is Gerard (or Lucas) Horenbout. British Library Add. MS 34294 (image is in the Public Domain). April from Les Tres Riches Heures du Duc de Berry, Musee Conde, Chantilly (image is in the Public Domain). 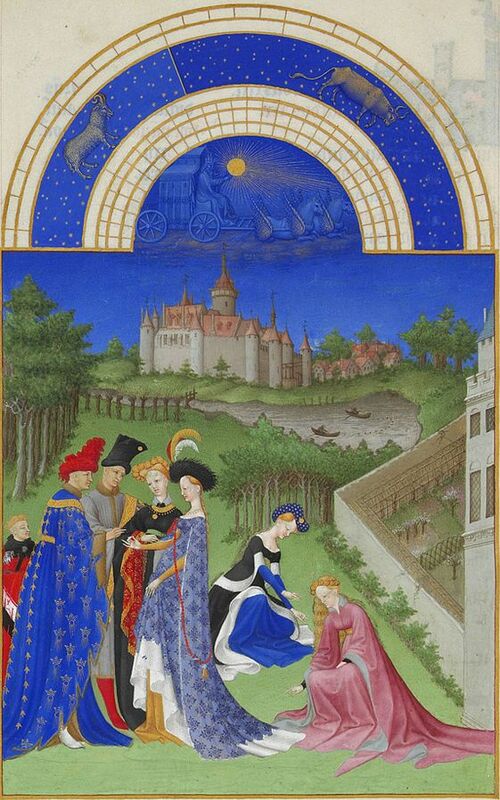 In the foreground, a young man and woman are engaged: the castle in the background is believed to be that of Dourdan near Paris. Calendar page for April, from the Huth Hours, with a courting couple in a garden. British Library Add. 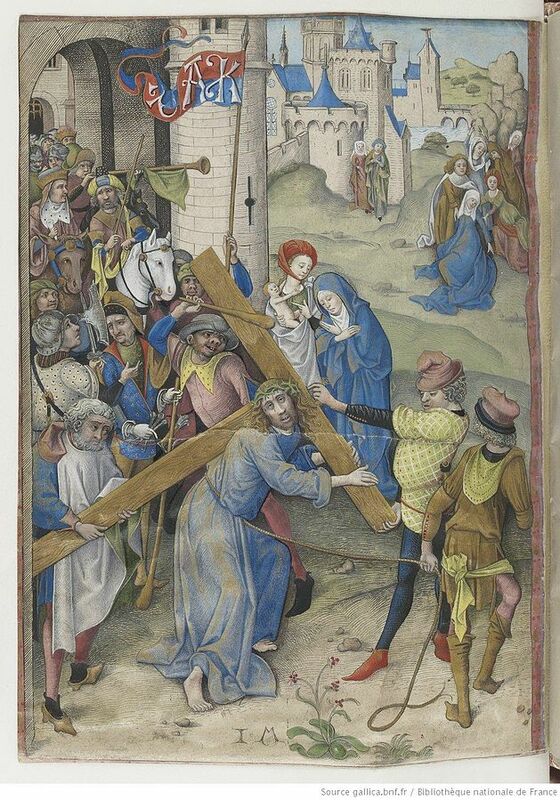 Ms. 38126f4v (image is in the Public Domain).